Every time I order this salad at a restaurant or try it at someone's home, I cannot help but to compare it to Ms. Kathy's homemade version. The very first time I tried this wonderful salad was at a potluck at work in the early 90's, and it was Ms. Kathy who made it. When I asked what kind of salad it was, one of our co-workers blurted out; "Chinese chicken salad" in the background, to which Ms. Kathy quickly rebutted with, "Excuse me! It's Kathy's Chinese Chicken Salad, OK!" Whoa! she really takes pride in her salad, I thought. And as I kept on eating this flavorful concoction, I realized she has good reason to proudly put her name on it. 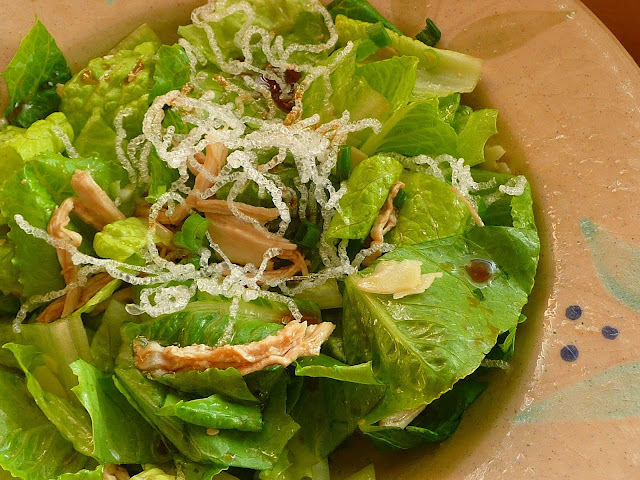 From then on, every Chinese chicken salad I eat must come close to that of Ms. Kathy's. And although I never got the recipe, and have now lost contact with Ms. Kathy since the 90's, I, like her, also take pride in my own version. Afterall, I have a great salad to live up to, and to stay true to its legend, I now also take this to potlucks, or just about any get togethers. 1. Combine all dry ingredients and chill. 2. Prepare the salad dressing and transfer to a cruet. 3. 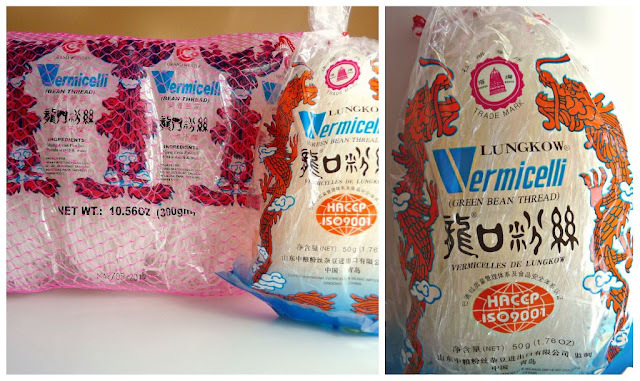 Fry the vermicelli noodes. Let sit on paper towel and crumble on top of salad. 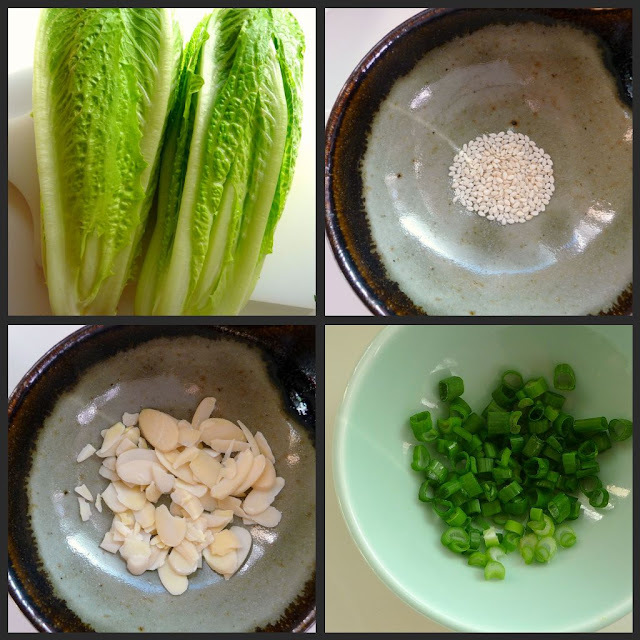 Clockwise from top left: Romaine lettuce hearts, sesame seeds, green onions, sliced almonds. packaging, that way I am only using a small batch at a time. Fry the noodles in very hot oil. 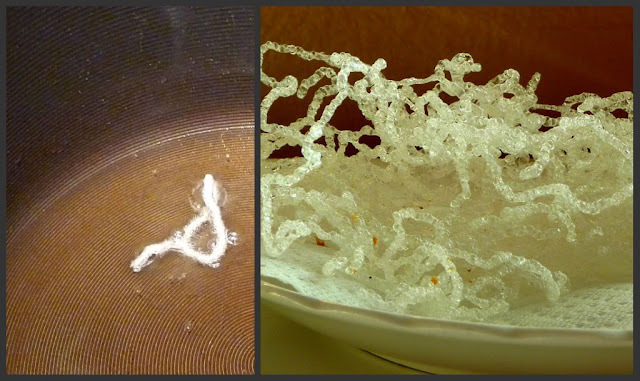 Be sure to do a test first by dropping a small piece of the noodle to see if it puffs up in just 1 to 2 seconds.